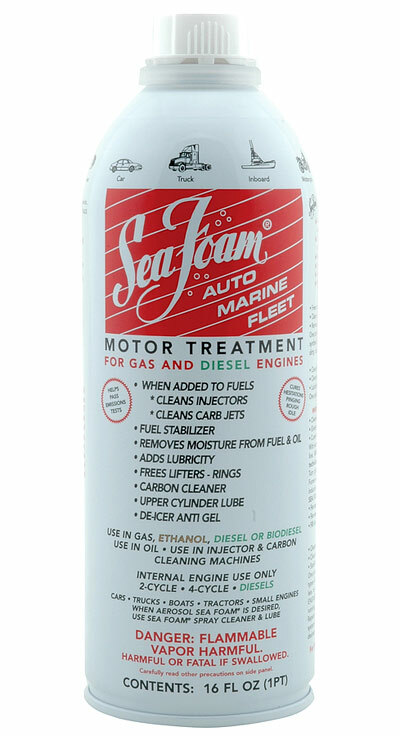 Sea Foam Motor Treatment might be a must-have all-purpose item for the household. I’ve been using the stuff for years. In cars, trucks, outboard motors, lawn equipment, logging equipment and more. I buy it by the gallon. It’s that ubiquitous. What Is Sea Foam Motor Treatment? What is Sea Foam? According to their website, Sea Foam was initially developed for the outboard motor and marine market back in the 1930s by Fred Fandrei. He was a District Manager for the Sinclair Refining Company (remember the dinosaur signs?) who owned an outboard motor that would gum up from the gas and oil mixture between uses. Necessity being the mother of invention he leveraged his knowledge of fuel to invent a product that will stop the gas/oil mixture from becoming stale. And so an empire was born. Fast forward 80 plus years and the product is still going strong. Their website shows all kinds of uses for it. To clean fuel systems including gasoline and diesel, and lubrication systems – particularly vehicle oil. It cleans, flushes and stabilizes. How much do you add to fuel? Add 1 ounce per gallon of fuel. Use 2 or more ounces per gallon – the more you add to fuel, the better it cleans. Use 50/50 mixed with gas. – For car and truck engines, I add some to the fuel tank every time I do an oil change. This keeps injectors clean and the vehicle running smoothly. – Works in crankcase oil to liquefy harmful residues deposits: For my diesel truck I fill up the new fuel filter with Sea Foam before swapping it out for the old one. Some smoke may billow out for a few miles but it’s doing a great job cleaning the carbon deposits. This happens about annually. – 50-100 miles prior to changing the oil in a car or truck, I’ll add a few ounces into the engine oil. When you go to drain the oil, it frees up lots of gunk and crud which comes out with the oil. The cleaner the better, right? – For marine and lawn equipment I run it in the fuel mix: it both stabilizes and cleans. – For stored fuel it stabilizes: gas or diesel fuels, up to 2 years. It’s safe for all gasoline & diesel engines. – 2-stroke equipment that has been sitting a bit too long and is gummed up, I’ll tilt it so the throat of the carburetor is facing upward then flood it out with Sea Foam. Let set for a few minutes, then start cranking. May have to repeat this process a couple times, but once the engine revs up and the smoke dies down you’re GTG! 1. 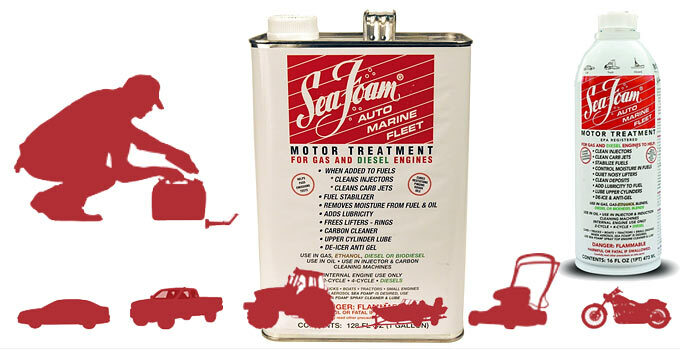 Sea Foam Motor Treatment works to dissolve and clean fuel deposits and sticky residues from gas and diesel injectors, carburetors, and combustion chambers. 2. 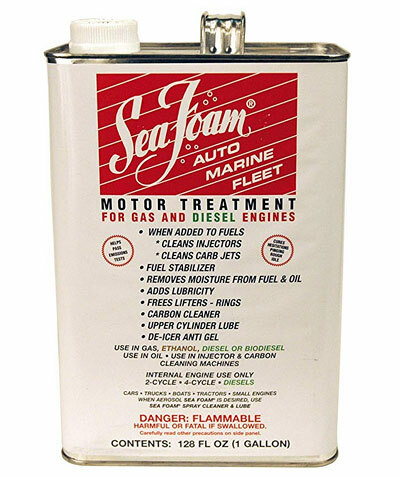 Sea Foam helps to stabilize stored fuel for up to two years by resisting evaporation, preserving ignition vapors, and preventing the formation of gum and varnish. 4. Sea Foam only contains petroleum-based ingredients. It does NOT have harsh detergent or abrasive chemicals that can harm your engine. The more you add to fuel, the better it cleans. I’ve tried StaBil, PRI-D and G, Lucas, and others, and am confident they all work, but the Sea Foam is the one-does-all IMO. And now that I’ve scrolled through a few pages of their website have even more ideas. The stuff just works! Or you can find it at big box and auto parts stores. I agree. I think all Seafoam products are the very best you can buy. The transmission additive simply works, and is the only additive many pros like. These people do not lie about what their products do…and they DO work. I use Seafoam. It works. As a motorcycle rider who travels back roads in out of the way places, I would find myself, many times, very low on fuel and not sure I wouldn’t run out before coming to a town that had a service station. The metal cans and sure sealing tops on Seafoam made a great way to carry extra emergency fuel in my saddle bags. Four of those 16 oz cans (1/2 gallon) meant a 20-25 mile cushion in range. That can be a life saver on the road. Very good to know. Will get some. Want to preserve my new John Deere mower. By the way not only do I remember the Sinclair sign, I remember a whole gas station in the shape of a green dinosaur some where on a old highway in Florida! Yup Sea Foam is great! I use for my generator maintenance too! When I run it once a year I add a few ounces and run the geni till the fuel runs out. I never thought to use sea foam before as a cleaner for your engine oil? Then change it out… Who would of thought that. I’ll try it on my crappy old lawn mower and see what junk oozes out. Old timer Wisdom from Bogan, thanks for the info. I am just now noticing a “thumbs up” feature. I like it, but when did it appear? Have I been missing that? I noticed it this morning, thinking one of the articles has a Thumbs Up and Down. Can we use the one finger salute for our bridge trolls? I started with both (thumbs up and down) but I feel that simply a thumbs up (with counter) will serve its purpose (some fun, and hopefully good comments worth clicking the thumbs-up! 😉 ). Most commenters here would not feel the need to thumbs down anyone (so I removed it). If a troll comes along, we’ll just ignore it and/or I’ll swat it away as best I can. In the Jeep/OHV community, Sea Foam is popular. We tend more towards “do it yourself” than towards paying someone else to do it when it comes to modifying and working on our rigs. I used it to clean throttle body and injectors by disconnecting the air intake behind the air mass sensor and slowly pouring a little bit into the hose as the engine was running. I’ve seen it used as a fuel system cleaner by pouring it into the fuel tank, used to clean the engine by adding to the crankcase (in the engine oil) shortly before changing it, etc. Sea Foam has a huge following in the off road and mechanic community. Until recently, I simply was not aware it could be used to stabilize fuel. Honestly I have never used it, or most Additives, until storing fuel, only have used PRI-D and G.
Just finished adding it to Quad, gens, trucks, tractor, stored fuel, …. sure hope it is as good as many mechanics say. Ken, I like the thumbs up. Should cut down on superfluous comments. Keep that motor running smooth with Sea Foam and your mind active with an ever expanding vocabulary – I guess a little mint does not hurt either. A Mint Julep you say? I will have to agree. Since one of those is well known to keep my motor running! Have drank Gin Mint Julips all my life, Beach’n showed me the way. Thank God for MSB and open communications. Thass whut I mean. Or maybe it wuz Steppenwolf. Whomever…. Yous an’ Beach’n is welcome to my BOL anytime! Olives? Oh, them green thangs. OK. I got some. LOL!!!! OBTW….Sea Foam works very nicely. I have used it in various engines. Not as good with evaluations as some on here, but haven’t had any lock-ups, seized cranks, etc., as might be expected in normal UN-maintained engines. It does work! and to stay on track… Hubby is going to try seafoam in our generators this time. We usually run them dry using ethanol free gasoline treated with Stabl. Has worked great. Now that you know what superfluous means, can you pronounce it? thanks for the article. I have used Sea Foam a couple of times. Seems to work well. For major engine cleanouts, like say every 70,000 miles I use a Kano Labs product called Kreen. I add this to the oil, let the engine run idle for about 45 minutes then shut it down. let it sit overnight. The next day change the oil. this product cleans all the carbon out of the engine, So much so, that your mileage will be poor for the first tank of gas, until rings carbon up a bit to seal. This makes the engine run a lot better improving power and gas mileage. For my Dad’s old ’77 300D, I use Diesel Purge, which does a great job of cleaning the diesel injection system.. (I also do the Kreen cleanout in the oil every so often). BTW Kano Labs, who makes Kreen, makes the famous Kroil, the penetrating oil that creeps into a millionth of an inch crack, dissolves rust. Have used this product for decades. Just my thoughts and experience for thought. YMMV. cheers. I have used Sea Foam for years. Treat all my storage gas with it, keep it in all the fuel tanks ,pressure washer, generator, chain saw, etc. I close off the fuel and run the carb dry on the generator, and that is all. My 4 wheeler stays at my hunt camp. When season is done, I disconnect the battery and it sits until next season. Do not drain the carb, just park it., been years now, no problems. I do not think there is any better treatment. YouTube: Project Farm- Sea Foam, I can’t believe what it did to my engine. Part 2 is one year later, ” Sea Foam fix, did it last? Update on the Ford Ranger. I have used Seafoam in all my small engines and tractor for years. Had an issue with one of my gennys not running the best, so I now.i always run Seafoam thru it. So just for the…….of it. I went to Seafoam’s website today. Never knew they had a product for trannys. Will have to give that a try, but I’ve never seen it before on shelves. Menard’s has Sea Foam up by the check outs for $7.00 a can. I have maybe 10 cans of it put up. What’s up with the red thumb? I just need to read a little further. Will Sea Foam work with synthetic oil? Matt, I use it in my car and it takes synthetic oil. So far its been real good. My question is how long can I store the bottles for? would it be worth it to store more than a couple at a time? Reason a store around here offers a Buy1 get 1free every so often. Would love to stock up on a few more cans. … but STP is the racer’s edge! Is there a difference between Sea Foam and StaBil? My family has used StaBil for many years on equipment that would not be used for an extended period of time such as putting it in the lawn mower before winter. Sounds like Sea Foam is some pretty good stuff. Will give it a try in the snowblower come spring. When it comes to putting it in the oil before an oil change, we don’t add anything to the oil before changing anymore. Years ago when I was young, my father would put some diesel into the oil before changing. What he did was get the engine nice and warmed up, add some diesel, let the engine run for a bit, and then change the oil while the oil was nice and hot. I remember seeing clumps of gunk pouring out. Then he would pour more diesel in the valve cover in attempt to flush the gunk in the pan. Then a small flush with fresh oil to remove the diesel remaining. Worked great. As we were pretty poor and the vehicles we got were second hand 10 owners before, that flushing did wonders for the cars. I am talking about cars that my parents paid a hundred or a few hundred dollars. Cars that were just above ‘rolls canardly’-rolls down one hill and can hardly make it up the next. I use Sea Foam all the time. I stabilize my store kerosene with it, I add a bit to bot the truck and van gas tanks. The only question I have with it is how will it effect my Butterfly stove (a kero cook stove) as far as it off-gassing any dangerous fumes or extra chemicals. I haven’t found any answers to this. I have at least 2-years of kero stored up and stabilized as far as how much my Butterfly stove uses.